One of the most popular questions coming from our clients in relation to Storyline-authored content is about offline viewing options. The reasons for such requirements vary. For example, one of our clients is deploying a healthcare-related series of courses in Africa, where at least a portion of the target audience may not have access to a reliable Internet connection. Another example is a client who wanted to show off our work on iPad®s during a tradeshow, but wanted to plan for offline delivery in case Wi-Fi was not provided during the event. While offline viewing may seem like a simple request, it can become quite complicated given the variety of options and requirements related to the authoring environments, target platforms and devices, and the necessity to take the Learning Management System (LMS) into account. As trivial as it seems, the term offline is as prone to misinterpretation as any other concept, so please allow me to define it first. Offline viewing means the ability to open and run a course without being concurrently connected to Internet. The course should therefore reside on a local drive of the device. For Storyline, the device is an iPad or a PC (running Microsoft Windows®) or a Mac®. An important disclaimer: Offline and LMS do not mix. A LMS is typically a remotely-hosted system that requires an Internet connection to launch and track the content. The advances of the Tin Can API carry promises of being able to host and run content offline, but at the moment this does not work with Storyline, and, for most part, this remains a theoretical proposition. We sincerely hope that this is about to change, but for the purposes of this article, it is crucial to understand that if you want to make Storyline courses available offline, these instances of the courses will not be tracked by your LMS. This means that if you are offering courses through a LMS, several instances of each course may need to be prepared: one for the LMS, one for offline viewing on iPad, and one for offline viewing on PC. 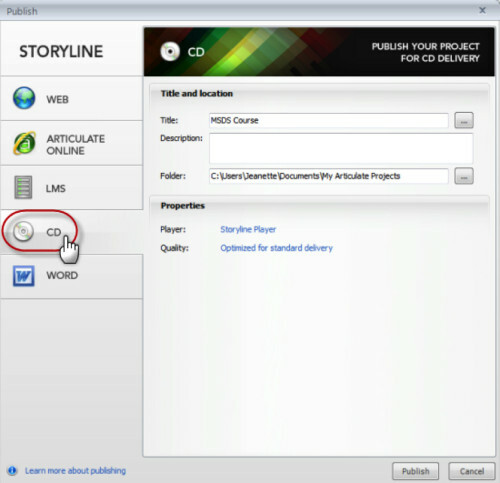 In order to provide offline capabilities for a Storyline course, it must be published using the settings shown in the screenshot below. 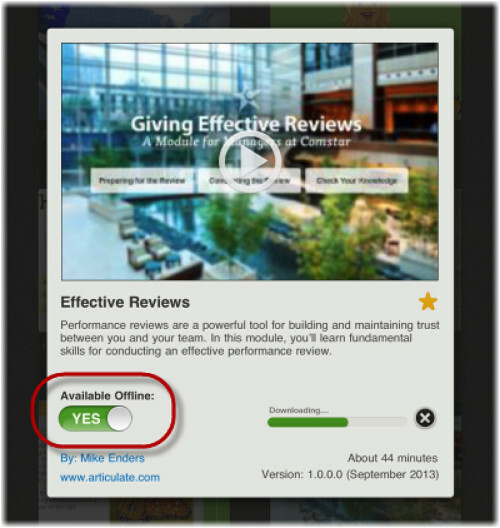 Articulate Mobile Player (AMP) is a free iPad app that will run your course. When the user first accesses the course, it will either launch AMP automatically (if AMP is already installed), or will route the user to the App Store, for a free, one-time download and installation of AMP. Once this is done, the course will be available from the AMP library. Another important disclaimer: initial Internet connectivity is required. The course must first be accessed via an online link, which means that your device must be connected. You also must retain connectivity in order to download AMP. Once the app is installed, and the course is open, the user will have to use the Available Offline toggle switch to download the course. Clearly, the course download also requires persistent Internet connectivity, but once this is done, the course becomes permanently available from the AMP library and will not require an Internet connection. No resources. Your Resource tab will disappear. You can still provide links to online documents and sites as part of the content, but they will not work without Internet connectivity for obvious reasons. Files that were embedded into the course as resources will not be accessible from AMP. No hanging menus. If you have Menu, Glossary, or Notes as part in the top navigation, they will automatically move, forming the left-hand side navigation bar. Default player. Player customizations, such as background color, color schemes, or alternative fonts will be reverted to default. AMP for Android™. At the moment, AMP is only available for iPad, but starting with the release of Storyline 2 (anticipated in Q4 of 2014) the Articulate Mobile Player is rumored to become available on Android tablets as well. Local PC distribution for Articulate courses is much simpler, and unlike the iPad example, it is indeed possible to load and run the courses with no dependency on Internet connection. Since each published course is a collection of files, the files can be simply transferred to a PC or a Mac machine on a CD, flash drive, or any other removable media. If you view published Articulate Storyline content on your local hard drive or send it to someone else to view on their local hard drive, you’ll encounter security restrictions from the computer, web browser, Flash Player, and network that’ll cause various features of your content to fail. In my experience, the courses will behave adequately as long as you stay away from Microsoft Internet Explorer®, and use latest versions of Google Chrome™, Mozilla Firefox®, or Safari® instead. You may also need to allow access to the local files for the embedded resources to work properly. Please talk to your technical support team to allow the access, depending on your PC and browser configuration. Also, Storyline provides a publishing option specifically meant for offline distribution. This method is also prone to local security restrictions, but according to Articulate, it has the greatest chance for a smooth offline experience. Files published for CD can then be distributed to your users and accessed from local or removable drives. Photo credit: Eric Dombach via Flick.com Creative Commons.